Reward Points: 9 9 points = S$0.18. 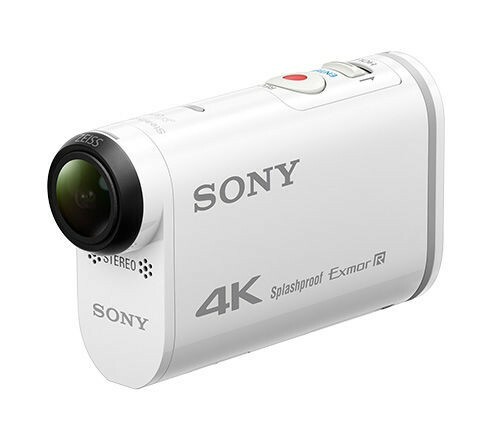 Sony FDR-X1000V Action Camera combines all the features experienced users have been waiting for. 4K picture quality is equal to that of current Hollywood blockbusters, enhanced SteadyShot™ stabilization makes getting great shots easier, and handy features like the Highlight Movie Maker help you turn all that footage into a mesmerizing masterpiece. SDXC/SDHC memory card (UHS-I U3 or higher) is required for 4K 100Mbps recording and SDXC/SDHC memory card (Class 10 or higher) is required for 4K 60Mbps and HD 50Mbps recording. To use SDHC memory card, firmware update of camera may be required. Boost your image stabilization by almost 3 times. Shoot everything from motocross to aerial landscapes with the SteadyShot™ feature. It's especially effective against low amplitude vibration - such as that caused by radio-controlled helicopters. Live Streaming, no waiting. Nothing’s more exciting then watching the action as it happens…especially if you or family and friends are quite distant. Wi-Fi and the USTREAM site let you instantly share the fun. Burst shooting lets you pick the defining moment. Shoot top-quality images and still enjoy the flexibility to choose the exact spin, twist, or expression you prefer. Settings are 10fps/1sec, 5fps/2sec, and 2fps/5sec. OK, you’ve shot some incredible footage. Now it’s time to meld it all into an unforgettable movie that will please you and astound family and friends. Let Highlight Movie Maker assemble a share-ready clip. Forget troublesome editing, or finding good stuff within long footage. Highlight Movie Maker takes care of all that with a “best of the best” clip that’s ready to share on social media. Now Action Cam App makes everything easy. You can enjoy editing your footage even right after shooting with your Action Cam anytime, anywhere. Action Cam Movie Creator makes expert editing stress-free. Loaded with features like background music selection, GPS data overlay, movie rotation, video merge, and slow/fast-forward editing, you’re going to find the Editor’s chair very comfortable.For Windows/Mac. For shooting as unlimited as your imagination. The FDR-X1000V is ready to go everywhere. Its IPX4-class splashproof design shrugs off wet weather like fog and drizzle. For challenging shoots, the included waterproof case9 is good down to 10m while the optional dive door accessory will handle an amazing 60m. And of course it’s heat, dust, and sand resistant. So plan your next adventure with no limits.